Talking with Sen. Dino Rossi of Sammamish, who stepped down in 2003 to run for governor but is back just for the 2017 session. He was appointed to succeed the late Sen. Andy Hill until this year's general election, and I look forward to working with him while he's here. The response to my first e-newsletter as 12th District senator was very positive – thank you! If you have friends or neighbors in our district who might like to subscribe (click here for the link), I hope you will forward this second installment to them. With all of the opening-week traditions behind us, this second week found Senate and House members settling into our committee work. Tuesdays and Thursdays are my busiest days, when all three of my committees meet; our transportation committee also met on the other days. My Senate office saw a steady stream of visitors when I was not in committee or leadership meetings, and I appreciate that so many people from our district braved the weather this week to come and meet with me. When it comes to my calendar I always give priority to my constituents, so please let my office know if you plan to be in Olympia. The Legislature used to meet only in odd-numbered years, so it adopted budgets that covered two years at a time. That “biennial” (meaning two years) approach to budgeting has continued even though we now meet annually. In even-numbered years we look at the existing budgets, as they near their halfway point, to make any necessary adjustments. The length of our session is based on the budget: 105 days when we need to agree on new plans, as is the case for this year, and 60 days when we are making revisions to the budgets passed the previous year. When most people speak of the state budget, they mean the operating budget that pays for the day-to-day services and programs, including education. There are two other budgets, however. One is the capital budget has to do with the state’s physical assets, such as buildings and land. The other is the transportation budget, which pays for roads and transit and most of the Washington State Patrol’s costs. As a member of our transportation committee, I will be working on the Senate’s proposed transportation budget for 2017-19. The governor proposes an operating budget each December for the incoming Legislature to consider. His latest proposal again calls for big tax increases and uses our public schools as the reason. I have seen this movie before – in 2013 and 2015. In both cases, the push by our governor and others for higher taxes reflected a deep philosophical divide that forced the legislative session into overtime. Instead of adjourning in late April, as scheduled, the 2013 session did not end until June 29 that year, and the 2015 session went even longer -- to July 10. The mix of Republicans and Democrats in the Senate and House is almost the same this year as in those two budget years. However, our Senate Majority Coalition Caucus has more experience at the budget-negotiating table now than in 2015 or 2013. This could translate into a more successful outcome this year. I am hopeful that we will wrap up the budgets and our other work within the 105 days allowed under the state constitution. The governor’s budget proposal for 2017-19 includes big new tax increases – he wants a new tax on income from “capital gains,” and a new tax on energy, and higher taxes on companies that provide services. I find the capital-gains income tax and the higher business taxes to be especially distasteful, because they really target the small employers who represent the economic backbone of our state. I am encouraged that the state's revenue collections (using existing tax rates) are forecast to run $2.7 billion ahead of the original projections. As a result, I favor holding the line on taxes and allowing the economy to continue growing, while continuing to make new investments for schools and other priorities. For that reason, I joined my fellow members of the Senate majority this past week to approve a rule that requires a two-thirds majority vote, not just a simple-majority vote, to move tax-increase bills to a final vote in the Senate. It does not prevent tax increases but makes them more difficult to approve and sends a strong message about our desire to protect taxpayers from needless increases. Although the signs of winter are all around, especially back home, I am already working to improve state government’s approach to wildfire management. Serving as vice chair of the Senate Natural Resources and Parks Committee and a member of the legislative “Fire Caucus” gave me two opportunities this week to engage with Hilary Franz, the state’s new commissioner of public lands. The degree of cooperation we receive from her agency (the Department of Natural Resources) will influence the amount of progress we make on wildfire policies. I am encouraged by her level of energy and interest in improving the health of our forests. Also, our district has benefited from an ongoing community conversation about wildfire thanks to a dedicated group of local leaders who are helping to influence state policy on wildfire. I look forward to sharing more information with you soon about their recent visit to Olympia. I discussed the budget situation and much more during an interview with Wenatchee's KOHO Radio this past Tuesday. I will be on the air with KOHO at 7:30 a.m. each Tuesday to provide a Senate update. I hope you will be able to listen in. You can click here to listen to the latest interview. It is my great privilege to serve as your state senator. If you have any questions or comments, please contact my office anytime using the information below. If you are planning a trip to Olympia and would like to visit the Capitol Building, I would be happy to connect with you or your group when you are here. I encourage you to share this newsletter with friends and family; they may subscribe using the information below my contact information. 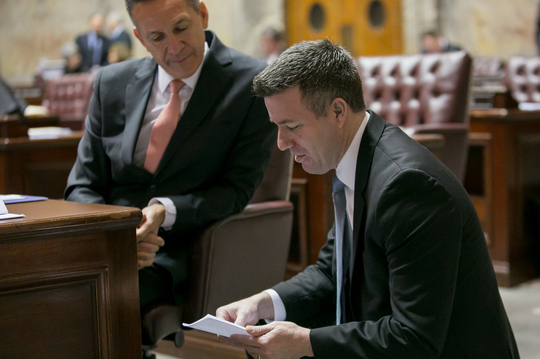 Thank you for allowing me to represent you in Olympia! Thank you for reading my e-newsletter! To update your subscription, modify your password or email address, or stop your subscription, visit the Subscriber Preferences Page. You will need to use your email address to log in. If you have questions or problems with this subscription, please visit subscriberhelp.govdelivery.com. Sen. Brad Hawkins serves Washington's 12th Legislative District, comprising all of Douglas and Chelan counties and part of Okanogan and Grant counties.